Caithness (Scottish Gaelic: Gallaibh [ ˈkal̪ˠɪv], Scots: Caitnes; Old Norse: Katanes) is a historic county, registration county and lieutenancy area of Scotland. Caithness has a land boundary with the historic county of Sutherland and is otherwise bounded by sea. The land boundary follows a watershed and is crossed by two roads (the A9 and the A836) and by one railway (the Far North Line). Across the Pentland Firth, ferries link Caithness with Orkney, and Caithness also has an airport at Wick. The Pentland Firth island of Stroma is within Caithness. The name was also used for the earldom of Caithness (c. 1334 onwards) and for the Caithness constituency of the Parliament of the United Kingdom (1708 to 1918). Boundaries are not identical in all contexts, but the Caithness area as of 2019[update] lies entirely within the Highland council area. Caithness is one of the Watsonian vice-counties, subdivisions of Britain and Ireland which are used largely for the purposes of biological recording and other scientific data-gathering. The vice-counties were introduced by Hewett Cottrell Watson, who first used them in the third volume of his Cybele Britannica, published in 1852. He refined the system somewhat in later volumes, but the vice-counties remain unaffected by subsequent local government re-organisations, allowing more accurate comparisons of historical and modern data. They provide a stable basis for recording using similarly-sized units, and, although grid-based reporting has grown in popularity, they remain a standard in the vast majority of ecological surveys, allowing data collected over long periods of time to be compared easily. The Caith element of Caithness comes from the name of a Pictish tribe known as the Cat or Catt people, or Catti (see Kingdom of Cat). The -ness element comes from Old Norse and means "headland". The Norse called the area Katanes ("headland of the Catt people"), and over time this became Caithness. The Gaelic name for Caithness, Gallaibh, means "among the strangers" (the Norse). The Catti are represented in the Gaelic name for eastern Sutherland, Cataibh, and the old Gaelic name for Shetland, Innse Chat. Caithness extends about 30 miles (50 kilometres) north-south and about 30 miles (50 km) east-west, with an area of about 712 square miles (1844 km²). The topography is flat, in contrast to the majority of the remainder of the North of Scotland. Until the latter part of the 20th century when large areas were planted in conifers, this level profile was rendered still more striking by the almost total absence of forest. The underlying geology of most of Caithness is old red sandstone to an estimated depth of over 4,000 metres. This consists of the cemented sediments of Lake Orcadie, which is believed to have stretched from Shetland to Grampian during the Devonian period, about 370 million years ago. Fossilised fish and plant remains are found between the layers of sediment. Older metamorphic (granite) rock is apparent in the Scaraben and Ord area, in the relatively high southwest area of the county. Caithness' highest point (Morven) is in this area. Because of the ease with which the sandstone splits to form large flat slabs (flagstone) it is an especially useful building material, and has been used as such since Neolithic times. Caithness is a land of open, rolling farmland, moorland and scattered settlements. The area is fringed to the north and east by dramatic coastal scenery and is home to large, internationally important colonies of seabirds. The surrounding waters of the Pentland Firth and the North Sea hold a great diversity of marine life. Away from the coast, the landscape is dominated by open moorland and blanket bog known as the Flow Country which is the largest expanse of blanket bog in Europe, extending into Sutherland. This is divided up along the straths (river valleys) by more fertile farm and croft land. The Caithness landscape is rich with the remains of pre-historic occupation. These include the Grey Cairns of Camster, the Stone Lud, the Hill O Many Stanes, a complex of sites around Loch Yarrows and over 100 brochs. A prehistoric souterrain structure at Caithness has been likened to discoveries at Midgarth and on Shapinsay. Numerous coastal castles (now mostly ruins) are Norwegian (West Norse) in their foundations. When the Norsemen arrived, probably in the 10th century, the county was inhabited by the Picts, but with its culture subject to some Goidelic influence from the Celtic Church. The name Pentland Firth can be read as meaning Pictland Fjord. Numerous bands of Norse settlers landed in the county, and gradually established themselves around the coast. On the Latheron (south) side, they extended their settlements as far as Berriedale. Many of the names of places are Norse in origin. In addition, some Caithness surnames, such as Gunn, are Norse in origin. For a long time sovereignty over Caithness was disputed between Scotland and the Norwegian Earldom of Orkney. Circa 1196, Earl Harald Maddadsson agreed to pay a monetary tribute for Caithness to William I. Norway has recognised Caithness as fully Scottish since the Treaty of Perth in 1266. The understanding of Caithness prehistory is well represented in the county, by groups including Yarrows Heritage Trust, Caithness Horizons and Caithness Broch Project. 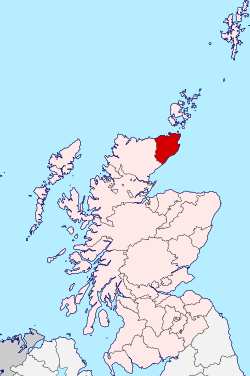 Caithness originally formed part of the shire or sheriffdom of Inverness, but gradually gained independence: in 1455 the Earl of Caithness gained a grant of the justiciary and sheriffdom of the area from the Sheriff of Inverness. In 1503 an act of the Parliament of Scotland confirmed the separate jurisdiction, with Dornoch and Wick named as burghs in which the sheriff of Caithness was to hold courts. The area of the sheriffdom was declared to be identical to that of the Diocese of Caithness. The Sheriff of Inverness still retained power over important legal cases, however, until 1641. In that year, parliament declared Wick the head burgh of the shire of Caithness and the Earl of Caithness became the heritable sheriff. Following the Act of Union of 1707, the term "county" began to be applied to the shire, a process that was completed with the abolition of heritable jurisdictions in 1747. The county began to be known as Caithness-shire. The county began to be used as a unit of local administration, and in 1890 was given an elected county council under the Local Government (Scotland) Act 1889. Although officially within the county, the burghs of Wick and Thurso retained their status as autonomous local government areas. At that time, two towns Wick and Thurso, were already well established as autonomous burghs with their own burgh councils. Ten parish councils covering rural areas were established in 1894. Wick, a royal burgh, served as the county's administrative centre. In 1930, the parish councils were abolished under the Local Government (Scotland) Act 1929. In 1975, the Local Government council and the burgh councils were superseded under the Local Government (Scotland) Act 1973 when Caithness became one of eight districts, each with its own "district council", within the new two-tier Highland region. When created, the district included the whole of the county plus Tongue and Farr areas of the neighbouring county of Sutherland. The boundary was soon changed, however, to correspond with that between the counties. Caithness was one of eight districts in the Highland region. Highland region was also created in 1975, as one of nine two-tier local government regions of Scotland. Each region consisted of a number of districts and both regions and districts had their own elected councils. The creation of the Highland region and of Caithness as a district involved the abolition of the two burgh councils in Caithness, Wick and Thurso, as well as the Caithness county council. Wick, which had been the administrative centre for the county, became the administrative centre for the district. In 1996 local government in Scotland was again reformed, under the Local Government etc (Scotland) Act 1994, to create 32 unitary council areas. The Highland region became the Highland unitary council area, and the functions of the district councils were absorbed by the Highland Council. In 1996, Caithness and the other seven districts of the Highland region were merged into the unitary Highland council area, under the Local Government etc (Scotland) Act 1994. The new Highland Council then adopted the former districts as management areas and created a system of area committees to represent the management areas. Until 1999 the Caithness management and committee areas consisted of 8 out of the 72 Highland Council wards. Each ward elected one councillor by the first past the post system of election. In 1999, however, ward boundaries were redrawn but management area boundaries were not. As a result, area committees were named after and made decisions for areas which they did not exactly represent. The new Caithness committee area, consisting of ten out of the 80 new Highland Council wards, did not include the village of Reay, although that village was within the Caithness management area. For area committee representation the village was within the Sutherland committee area. New wards were created for elections this year, 2007, polling on 3 May and, as the wards became effective for representational purposes, the Highland Council's management and committee structures were reorganised. The Caithness management area and the Caithness area committee were therefore abolished. In 2007 the Highland Council, which is now the local government authority, created the Caithness ward management area, which has boundaries similar to those of the historic county. It was divided between three new wards electing councillors by the single transferable vote system of election, which is designed to produce a form of proportional representation. One ward elects four councillors. Each of the other two elects three councillors. Also, the council's eight management areas were abolished, in favour of three new corporate management areas, with Caithness becoming a ward management area within the council's new Caithness, Sutherland and Easter Ross operational management area, which covers seven of the council's 22 new wards. The boundaries of the Caithness ward management area are not exactly those of the former Caithness management area, but they do include the village of Reay. The ward management area is one of five within the corporate management area and until 2017 consisted of three wards, the Landward Caithness ward, the Thurso ward and the Wick ward. Each of the other ward management areas within the corporate management area consists of a single ward. In 2017 the three Caithness wards were reduced to two 'Town and County' wards, each returning four members to the Highland Council, this was a reduction of two Councillors from the last election in 2012. The new wards are Thurso and Northwest Caithness and Wick and East Caithness. Since May 4th 2017 Caithness has been represented by four Independent Councillors, two Scottish Conservative Councillors and two Scottish National Party Councillors. The current Chairman of the Caithness Committee is Donnie Mackay (Independent) and the Civic Leader position is held by A.I Willie Mackay (Independent) both being installed on the 16th of June 2017 at the first Caithness Committee of the new council. The Caithness constituency of the House of Commons of the Parliament of Great Britain (1708 to 1801) and the Parliament of the United Kingdom (1801 to 1918) represented essentially the county from 1708 to 1918. At the same time however, the county town of Wick was represented as a component of Tain Burghs until 1832 and of Wick Burghs until 1918. Between 1708 and 1832 the Caithness constituency was paired with Buteshire as alternating constituencies: one constituency elected a Member of Parliament (MP) to one parliament and then the other elected an MP to the next. Between 1832 and 1918 Caithness elected an MP to every parliament. In 1918 the Caithness constituency and Wick were merged into the then new constituency of Caithness and Sutherland. In 1997 Caithness and Sutherland was merged into Caithness, Sutherland and Easter Ross. The Scottish Parliament constituency of Caithness, Sutherland and Easter Ross was created in 1999 and now has boundaries slightly different from those of the House of Commons constituency. It was replaced by the larger constituency of Caithness, Sutherland and Ross in 2011. The modern constituencies may be seen as more sub-divisions of the Highland area than as representative of counties (and burghs). For its own purposes, however, the Highland Council uses more conservative sub-divisions, with names which refer back to the era of district councils and, in some cases, county councils. In the Scottish Parliament Caithness is represented also as part of the Highlands and Islands electoral region. Prior to implementation of the Local Government (Scotland) Act 1889, civil administration parishes were also parishes of the Church of Scotland, and one Caithness parish, Reay, straddled the boundary between the county of Caithness and the county of Sutherland, and another, Thurso had a separate fragment bounded by Reay and Halkirk. For civil administration purposes, implementation of the act redefined parish boundaries, transferring part of Reay to the Sutherland parish of Farr and the fragment of Thurso to the parish of Halkirk. In the cases of two of the parishes, Thurso and Wick, each includes a burgh with the same name as the parish. For civil administration purposes each of these parishes was divided between the burgh and the landward (rural) area of the parish. Although created under local government legislation (the Local Government (Scotland) Act 1973) community councils have no statutory powers or responsibilities and are not a tier of local government. They are however the most local tier of statutory representation. Under the 1973 Act, district councils were obliged to implement community council schemes. A Caithness district scheme was adopted in 1975, dividing the area of the district between 12 community councils. Statutory status for community councils was continued under the Local Government etc (Scotland) Act 1994, and a Caithness scheme is now the responsibility of the Highland Council. The area of the former district of Caithness is now covered by 12 community council areas which are numbered and described as below in the Highland Council's Scheme for the Establishment of Community Councils in Caithness, October 1997. Current community council names and contact details are given on a Highland Council website. At the beginning of recorded history, Caithness was inhabited by the Picts, whose language Pictish is thought to have been related to the Brythonic languages spoken by the Britons to the south. The Norn language was introduced to Caithness, Orkney, and Shetland by the Norse occupation, which is generally proposed to be c. AD 800. Although little is known of that Norn dialect, some of this linguistic influence still exists in parts of the county, particularly in place names. Norn continued to be spoken in Caithness until perhaps the fifteenth century and lingered until the late 18th century in the Northern Isles. It is sometimes erroneously claimed that Gaelic has never been spoken in Caithness, but this is a result of language shift to Scots, and then towards Standard Scottish English during recent centuries. The Gaelic name for the region, Gallaibh, translates as "Land of the Gall (non-Gaels)", a name which reflects historic Norse rule. Gaelic speakers seem to first figure in the early stage of the Scandinavian colonisation of Caithness, gradually increasing in numerical significance from the 12th century onwards. Gaelic has survived, in a limited form, in western parts of the county. Scots, often referred to as English, began supplanting Norn in the early 14th century at the time of the Wars of Scottish Independence. The emergent Northern Scots dialect became influenced by both Gaelic and Norn and is generally spoken in the lowlying land to the east of a line drawn from Clyth Ness to some 4 miles (6 km) west of Thurso. The dialect of Scots spoken in the neighbourhood of John o' Groats resembles to some extent that of Orkney. Since the 17th century, Standard Scottish English has increasingly been replacing both Gaelic and Scots. Records showing what languages were spoken apparently do not exist from before 1706, but by that time, "[I]f ye suppose a Parallel to the hypotenuse drawn from Week to Thurso, these on the Eastside of it speak most part English, and those on the Westside Irish; and the last have Ministers to preach to them in both languages." Similarly, it is stated at that time that there were "Seven parishes [out of 10 or 11] in [the Presbytery of] Caithness where the Irish language is used." "A presbytery minute of 1727 says of 1,600 people who had 'come of age', 1500 could speak Gaelic only, and a mere five could read. Gaelic at this time was the principal language in most parishes except Bower, Canisbay, Dunnet and Olrig". "Persons with a knowledge of Gaelic in the County of Caithness (in 1911) are found to number 1,685, and to constitute 6.7 per cent of the entire population of three years of age and upwards. Of these 1,248 were born in Caithness, 273 in Sutherland, 77 in Ross & Cromarty, and 87 elsewhere.... By an examination of the age distribution of the Gaelic speakers, it is found that only 22 of them are less than 20 years of age." According to the 2011 Scotland Census, 282 (1.1%) residents of Caithness age three and over can speak Gaelic while 466 (1.8%) have some facility with the language. The percentage figures are almost exactly the same as for all of Scotland (1.1% and 1.7%, respectively). Nearly half of all Gaelic speakers in the county live in Thurso civil parish. The town of Thurso hosts the only Gaelic Medium Primary School unit in all of Caithness (see Language in Thurso). The bilingual road sign policy of Highland Region Council has led to some controversy in the region. In 2008, eight of the ten Caithness representatives to the Highland Council tried to prevent the introduction of bilingual English-Gaelic road signs into the county. The first bilingual sign in Caithness was erected in 2012. In 2013, a bilingual road sign on the A99 road next to Wick Airport was damaged by gunfire within 24 hours of it being placed. Gaelic-speaking Councillor Alex MacLeod, at the time representing Landward Caithness in the Highland Council, referred to it as “an extreme anti-Gaelic incident”. St John's Loch near Dunnet Head has the distinction of supporting the most northerly hatch of Mayfly in the British Isle. The underlying geology, harsh climate, and long history of human occupation have shaped this rich and distinctive natural heritage. Today a diverse landscape incorporates both common and rare habitats and species, and Caithness provides a stronghold for many once common breeding species that have undergone serious declines elsewhere, such as waders, water voles, and flocks of over-wintering birds. Many rare mammals, birds, and fish have been sighted or caught in and around Caithness waters. Harbour porpoises, dolphins (including Risso's, bottle-nosed, common, Atlantic white-sided, and white-beaked dolphins), and minke and long-finned pilot whales are regularly seen from the shore and boats. Both grey and common seals come close to the shore to feed, rest, and raise their pups; a significant population over-winters on small islands in the Thurso river only a short walk from the town centre. Otters can be seen close to river mouths in some of the quieter locations. The John O'Groat Journal and The Caithness Courier are weekly newspapers published by Scottish Provincial Press Limited trading as North of Scotland Newspapers and using offices in Union Street, Wick (but with public reception via Cliff Road) and Olrig Street, Thurso. News coverage tends to concentrate on the former counties of Caithness and Sutherland. The John O'Groat Journal is normally published on Fridays and The Caithness Courier on Wednesdays. The two papers share a website. Historically, they have been independent newspapers, with the Groat as a Wick-centred paper and the Courier as a Thurso-centred paper. Even now, the Groat is archived in the public library in Wick, while the Courier is similarly archived in the library in Thurso. The Courier was printed, almost by hand, in a small shop in High Street, Thurso until the early 60's by Mr Docherty and his daughter. The Courier traditionally covers that week's sheriff court cases. Caithness FM has been broadcasting since 1993 and the Orkney Commercial Radio, Superstation Orkney from Kirkwall since 2004. ^ "Index: C". British History Online. Institute of Historical Research and the History of Parliament Trust. Retrieved 4 July 2017. ^ Scholarly essays in J.R. Baldwion and I.D. Whyte, eds. The Viking Age in Caithness, Orkney and the North Atlantic (Edinburgh University Press) 1993, give an overview. ^ "Priests and Picts". Caithness Archaeology. Retrieved 7 August 2016. ^ Logan, F. Donald (2005). The Vikings in History (3rd ed.). New York: Routledge. p. 28. Retrieved 7 August 2016. ^ MacBain, Alexander (1922). Place Names Highlands and Islands of Scotland. Stirling: Mackay. p. 21. ISBN 978-1179979427. Retrieved 7 August 2016. ^ "Yarrows Heritage Trust - Home". www.yarrowsheritagetrust.co.uk. Retrieved 16 March 2018. ^ Campbell, H F (1920). Caithness & Sutherland. Cambridge County Geographies. Cambridge: Cambridge University Press. pp. 1–2. ^ Whatley, Christopher A (2000). Scottish Society 1707–1820. Manchester University Press. p. 147. ISBN 978-0-7190-4540-0. ^ Butlin, Heather. "Council wards". www.highland.gov.uk. ^ Butlin, Heather. "Council ward information". highland.gov.uk. ^ Tarrant, Sylvia. "Caithness Committee Chair and Civic Leader appointed". www.highland.gov.uk. ^ "Community 03 March 2008, accessed 3 March 2008" (PDF). Highland Council website. Archived from the original (PDF) on 24 October 2007. Retrieved 3 March 2008. ^ Jones, Charles (1997). The Edinburgh history of the Scots language. Edinburgh: Edinburgh University Press. p. 394. ^ Jamieson, J. (1808), An Etymological Dictionary of the Scottish Language. ^ Murray, James A. H. (1873) The Dialect of the Southern Counties of Scotland, Transactions of the Philological Society, Part II, 1870–72. London-Berlin, Asher & Co.
^ Grant, William; Dixon, James Main (1921) Manual of Modern Scots. Cambridge, University Press. ^ "SND Introduction". Archived from the original on 17 May 2013. Retrieved 8 March 2011. ^ Omand, D. From the Vikings to the Forty-Five, in The Caithness book. ^ "Bid to exclude Gaelic signs fails", BBC News, 6 March 2008. ^ Gordon Calder, "New bilingual sign sparks fresh wrangle," John O'Groat Journal, 10 August 2012. ^ Alisdair Munro, "‘Anti-Gaelic gunmen’ shoot road sign in Caithness", The Scotsman, 5 September 2013. ^ "Scottish Provincial Press Limited website". Archived from the original on 29 June 2007. Retrieved 28 June 2007. ^ "Services North – Search for local businesses in the North of Scotland". Caithness Courier. Archived from the original on 11 October 2007. Retrieved 28 June 2007. ^ "John O'Groat Journal - Home". www.johnogroat-journal.co.uk. Wikimedia Commons has media related to Caithness. Wikisource has the text of the 1911 Encyclopædia Britannica article Caithness.